Another Sunday morning spent happily with the Sun. 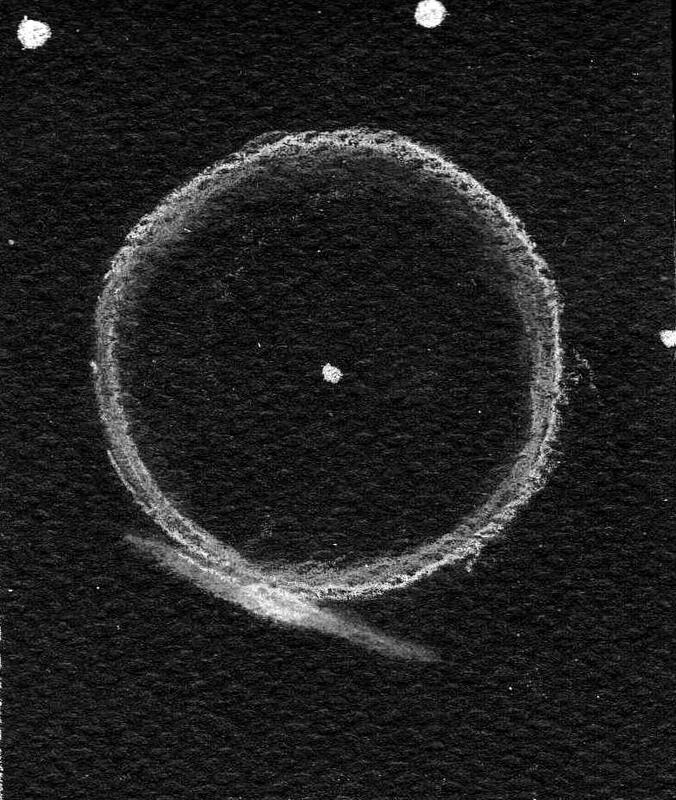 Today the first prominence that struck me was one that had the appearance of a very fine “tree” near a “bridge”. The details & seeing were excellent today and I could make out swirling and looping details within the prominence, a lacy network of light and dark. 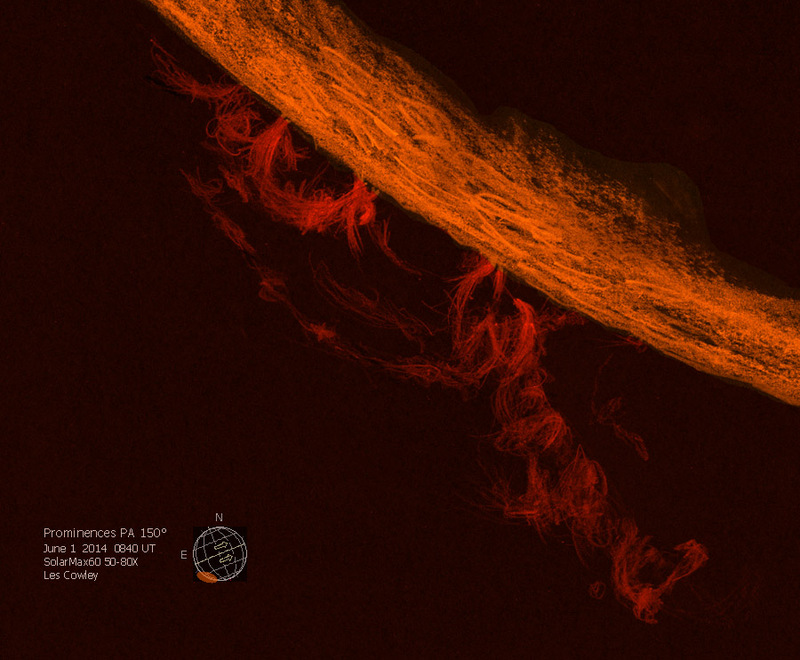 The prominence could be seen spilling onto the solar surface as a filament. I usually just cant leave done alone, so I tried some different things to colorize and experimented with Photoscape software. I fell upon the magic button – something called color balance. What fun to add color and see more of what I observed in the eyepiece! after I shared this with him, so I hope that it inspires other too. bee hives, building large garden structures and generally having a good time! and will make every endeavour to keep it that way. short hops would keep things accurate, I thought. with ‘scope’ excuse the pun. 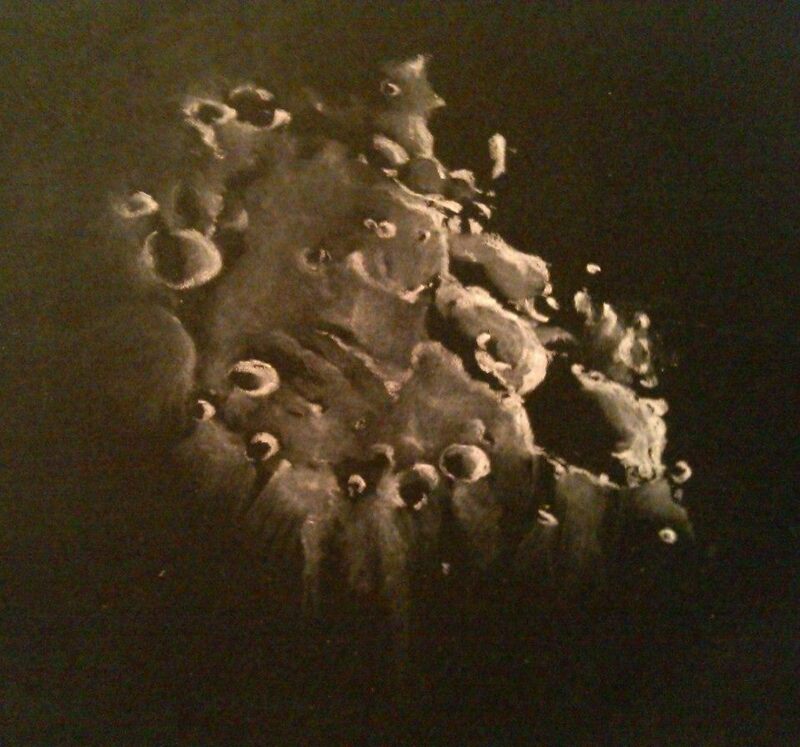 galaxy using white watercolour pencil and blending stump. I was back with a bang, catching a new object with an unexpected added attraction! Pitatus is an old, large 97 km. diameter crater on the edge of Mare Nubium. 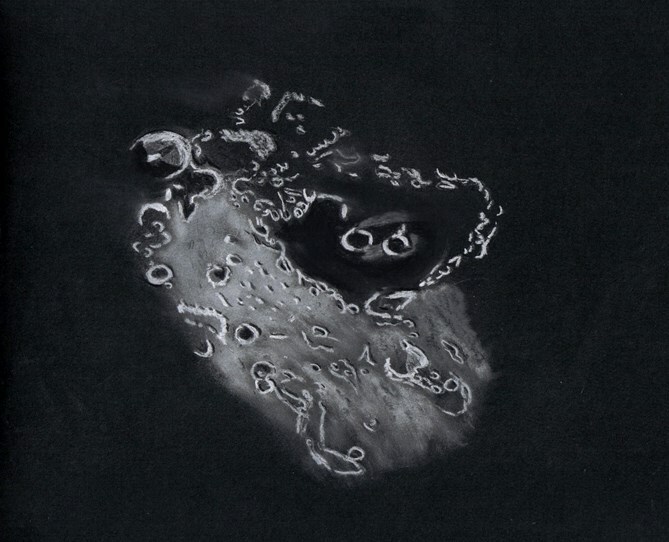 The floor of this crater has a linear central peak which was casting a fine elongated triangular shadow at the time of this observation and sketch. 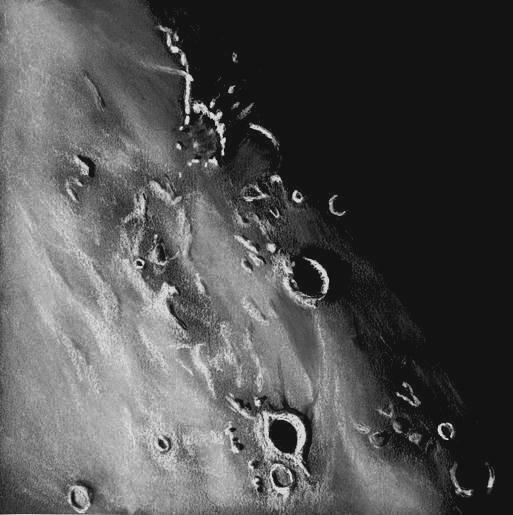 To the south craters Wurzelbauer (88 km.) 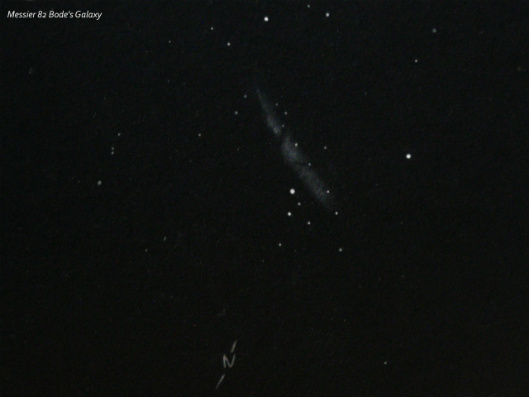 and Gauricus (79 km.) could be seen; both of these craters show badly warn rims; both much older than Pitatus. 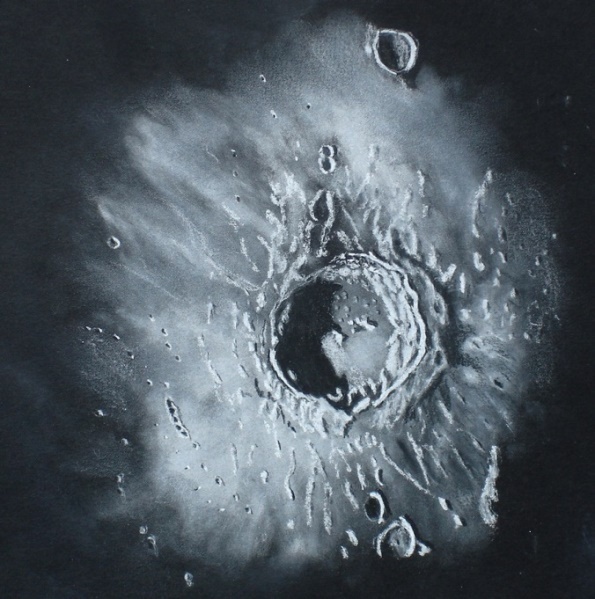 Attached to the northwest rim of Pitatus is the crater Hesodius (43 km.). 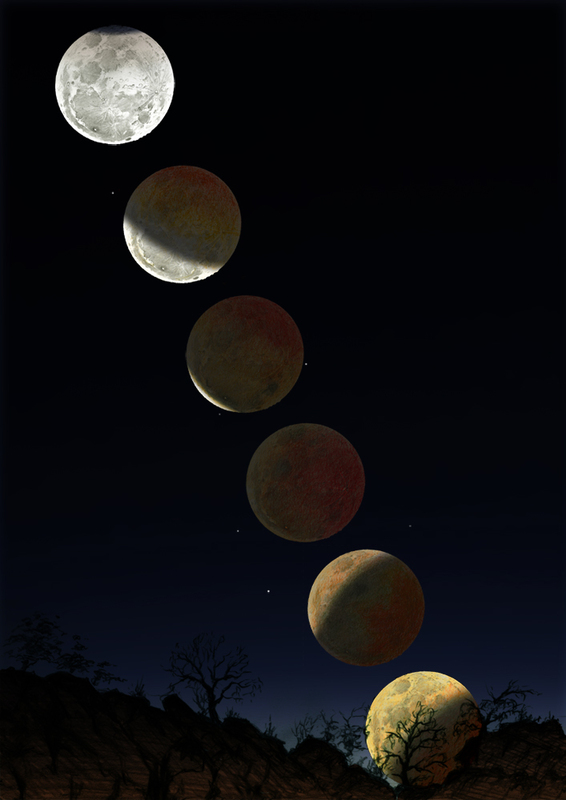 At about the eighth or ninth day of lunation you can observe the famous “sunrise ray” beaming across the floor of Hesodius through a break in the wall with Pitatus. This is certainly a sight worth observing. black Conte’pastel pencils and blending stumps. Among the large craters of the lunar southern highlands, a nearly 4 billion year old crater stood out over the terminator on this evening just after local sunset here in the central USA. This crater is the 230 km. diameter impactor known by the name Clavius. Clavius is blanketed with a sizable number of craters and numerous craterlets . The north-northeastern rim of Clavius has a large crater resting upon it and most of its rim is just catching the light of sunrise. This 52 km. diameter crater is Porter. Much of the central floor of crater Clavius remains in darkness except for Clavius D (21 km.) and to its right in the sketch Clavius C (13 km.). Note that crater D is casting a nice shadow across the high central floor which is just beginning to light up in the lunar morning sun. 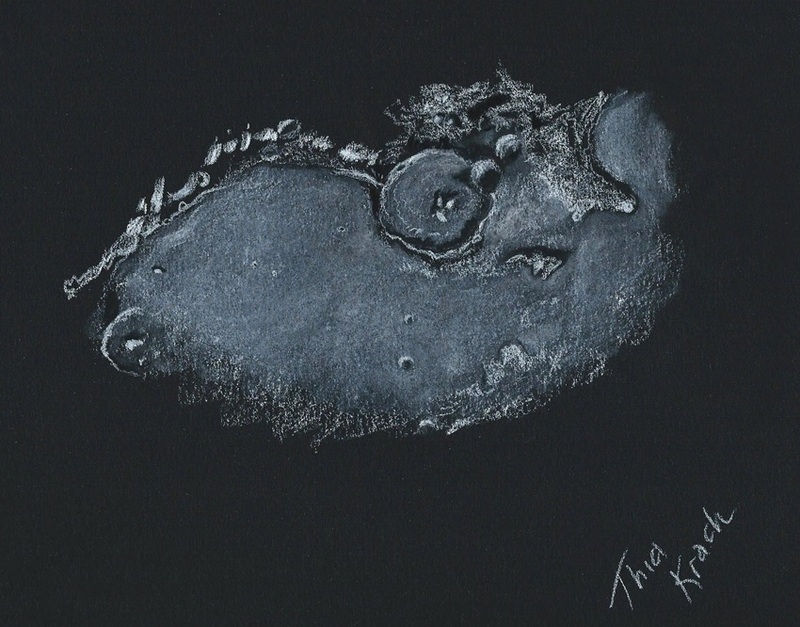 For this sketch I used: Black Canson sketching paper, 8”x10”, white and black Conte’ pastel pencils and blending stumps. 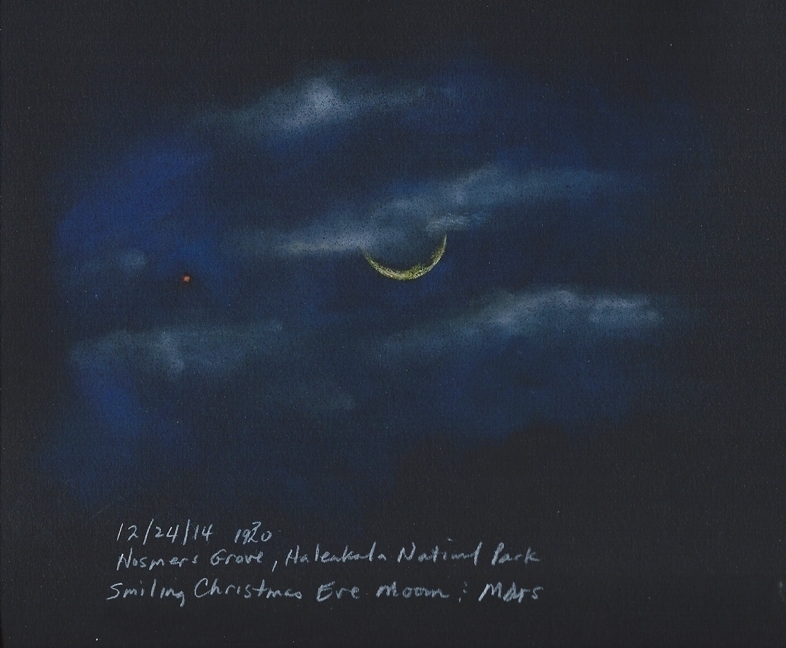 This was the first sketch I completed at Astrofest in Queensland, Australia. I’ve been wanting to sketch this beautiful dark nebula ever since I first laid eye on it some three years ago. 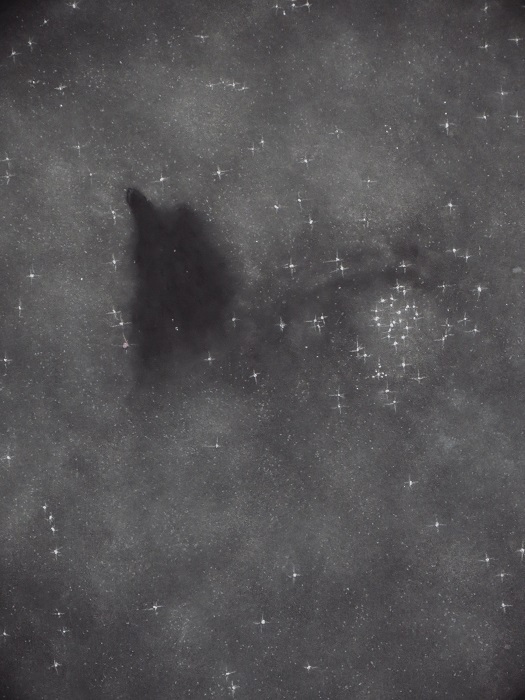 This dark nebula, B86, goes by the popular name of “The Ink Spot”. 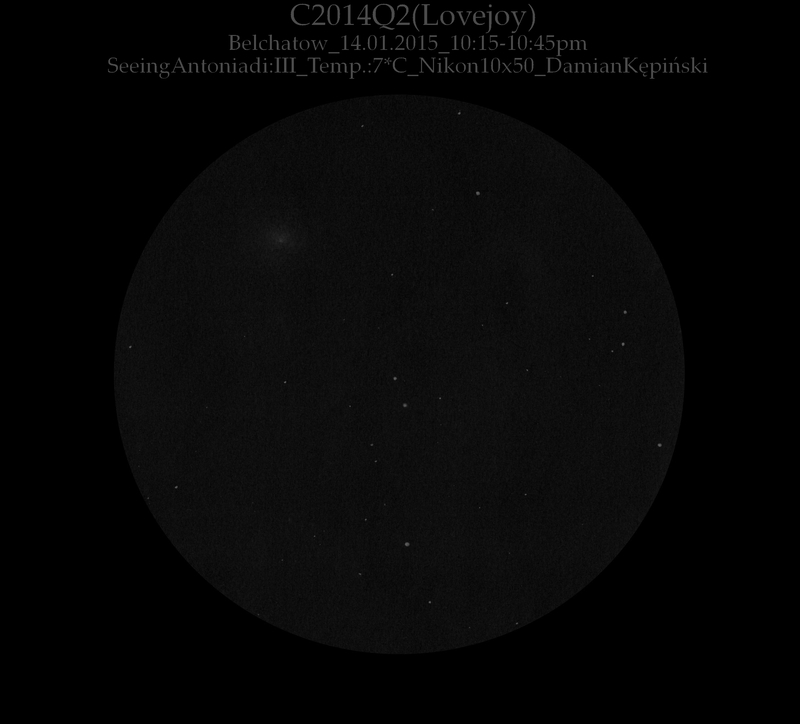 It sits smack bang in the centre of the densest star cloud in the whole sky, the Cloud of Sagittarius. And what sets it off even more is B86 has a gorgeous bright open cluster right next to it, NGC 6570. Both objects are more-or-less the same size as each other, even though both are not very large themselves. But it is the juxtaposition of these two very different objects against the blaze of the Milky Way that makes this pair a spectacular pairing. Dark nebulae are clouds of dust and gas that are drifting through the Milky Way galaxy. Many of these conglomerations of dust and gas do end up being formed into stars and planets, but most just end up forming the fabric of the galaxy. In fact, the stars that we see actually only form a small percentage of the actual mass of galaxies. 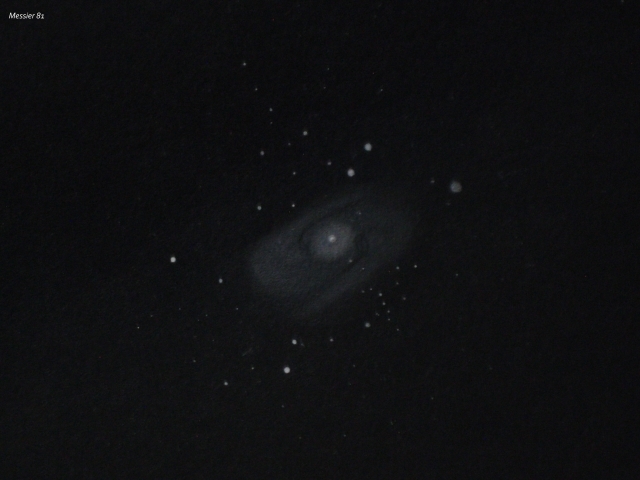 By far the greatest amount of a galaxy’s mass comes from this very dust and gas. The Ink Spot is a small patch of cloud. 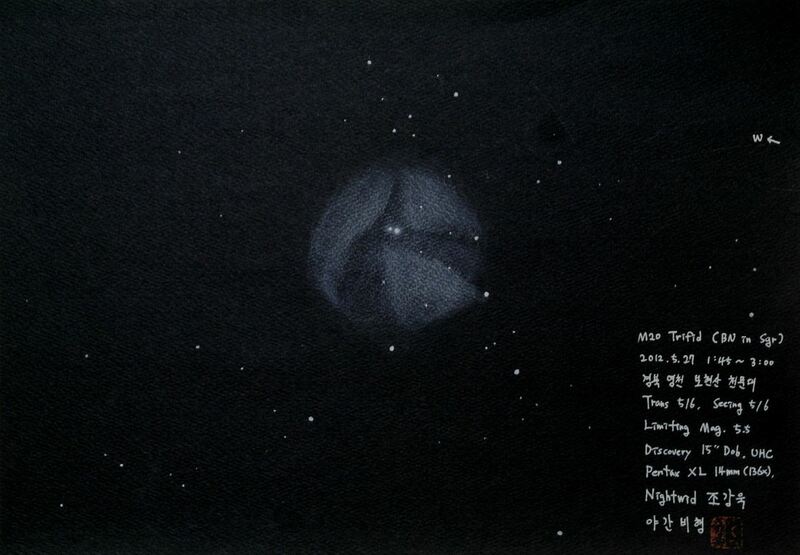 It is a very opaque nebula too. 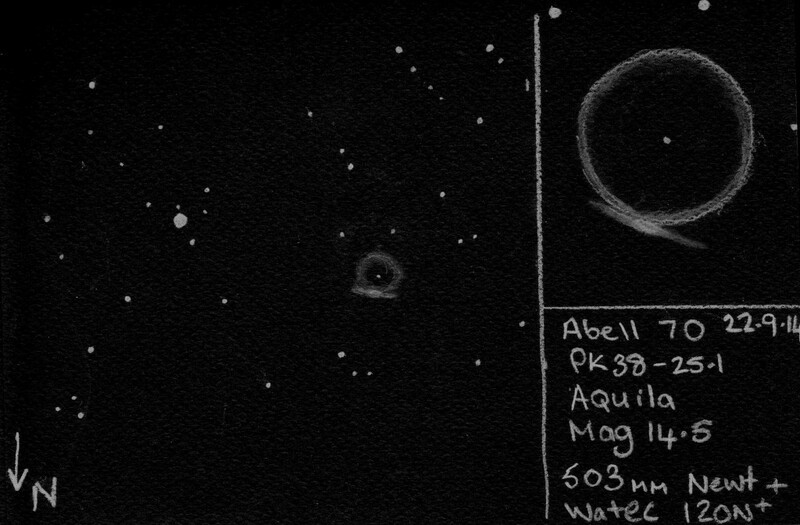 Dark nebulae are categorised according to their opacity, or how dark they are. The scale of opacity goes from 1 (very tenuous) through to 6 (very opaque). 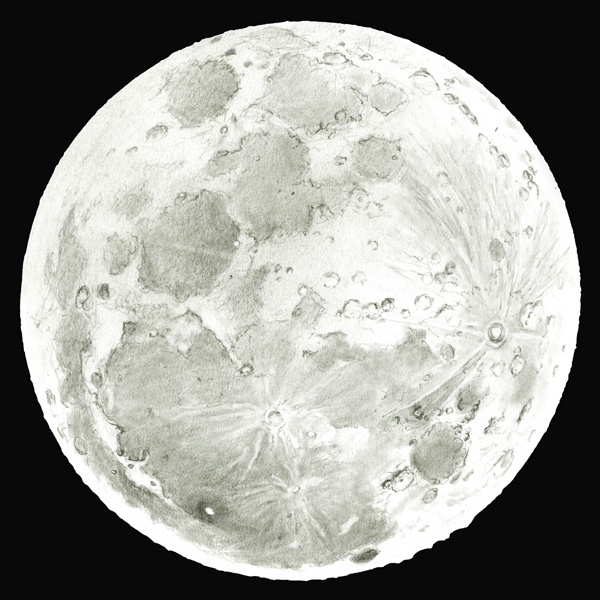 While the opacity of The Ink Spot may be a 5, it is because that it sits in the Cloud of Sagittarius that makes is a striking object. The little open cluster NGC 6520 really works very well in setting off B86. Open clusters are groupings of stars that are all related to each other having been formed out of the same parent cloud of gas and dust. Evidence for this is seen in the spectra of the stars displaying the same chemical make up. The brothers and sisters of our own Sun have been identified this way, with the same chemical signature as our Sun having been identified in several close by stars even though the Sun’s ‘siblings’ have long drifted off away from each other. Open clusters are loose groupings, so even though they formed from the same source, their gravitational connection to each other is not strong enough to keep the group together for too long. For me, this tiny patch of sky is one of my most favourite. Tiny and oh so precious. Brilliant, dark, stark, ghostly. All in one. Gorgeous. 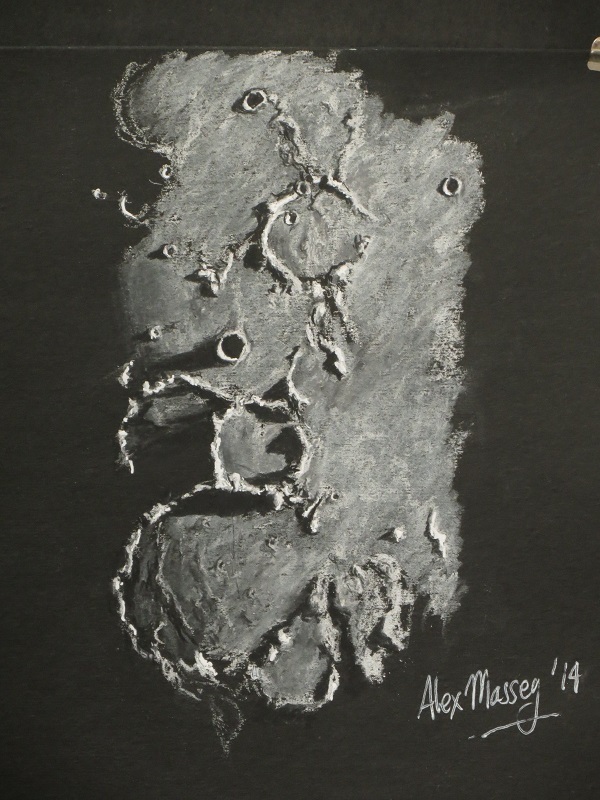 Media: Soft pastel, charcoal and white ink on A4 size black paper. As always, unless I have a specific target in mind, I just let my eye wonder along the terminator to see what pricks my interest. 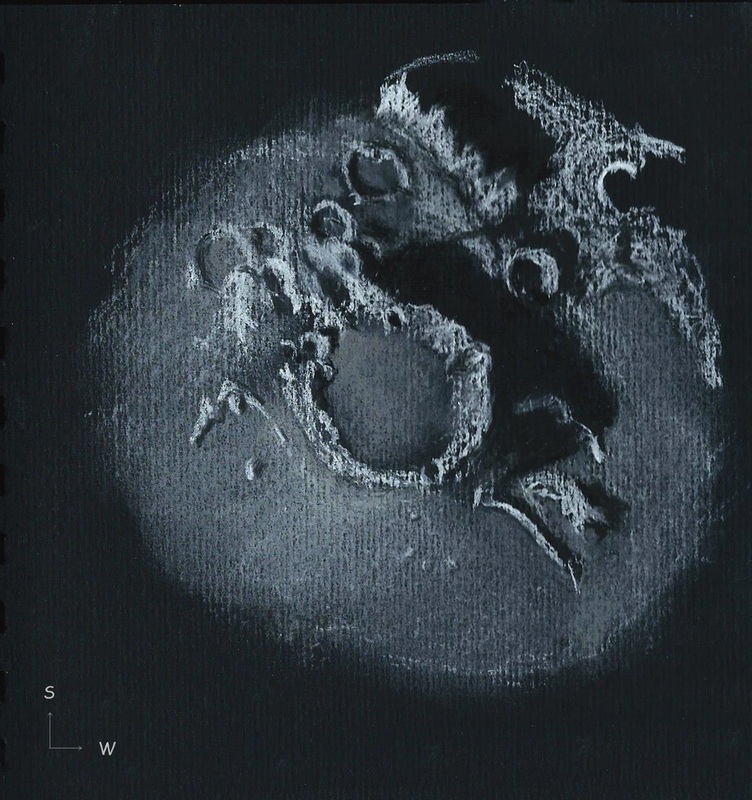 And, as there are several repeated alphanumeric apparitions on the Moon, I’ve found a second avian one! 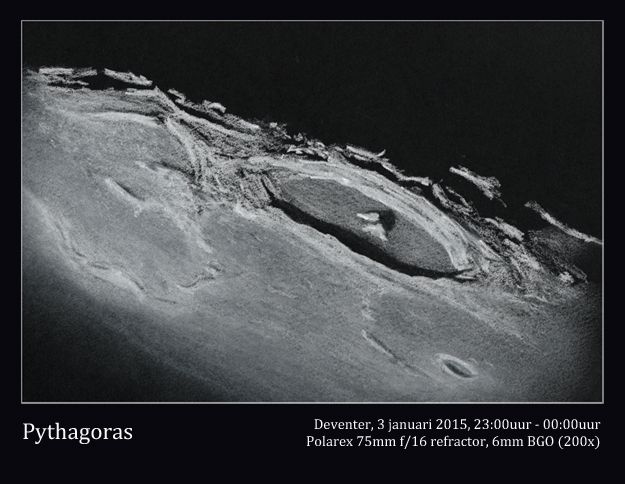 Some time ago I spotted an owl formed around the crater Mercator. Last night I found a second Owl, this time around the flooded craters Fra Mauro (the fat body), Parry (the right eye), and Bonpland (the left eye).Cute little fella I think is formed here J. 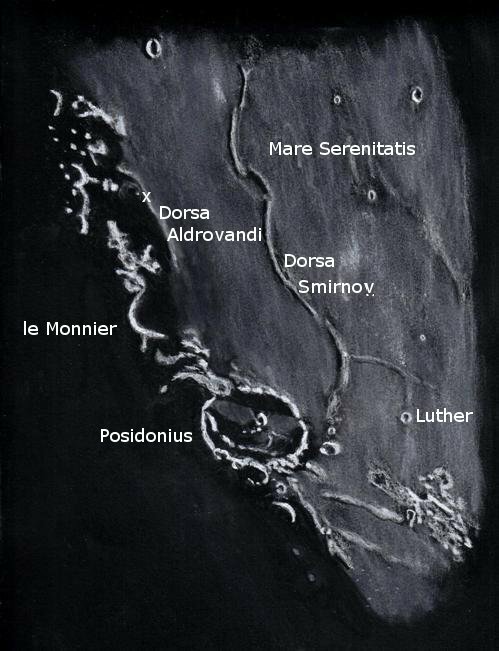 As it turns out, Fra Mauro is just to the south of the Apollo 14 landing site – south is to the top of the page, so the Apollo 14 site lies just below where the Owl’s feet would be. Two hundred or so kilometers to the southwest of the Altai Scarp you will find a mix of large and small highland craters that may catch your eye as they did mine. Many have written of the “boring” look-a-like craters of this region but good lighting can make a big difference in appeal here. Ancient Riccius crater (71 km.) 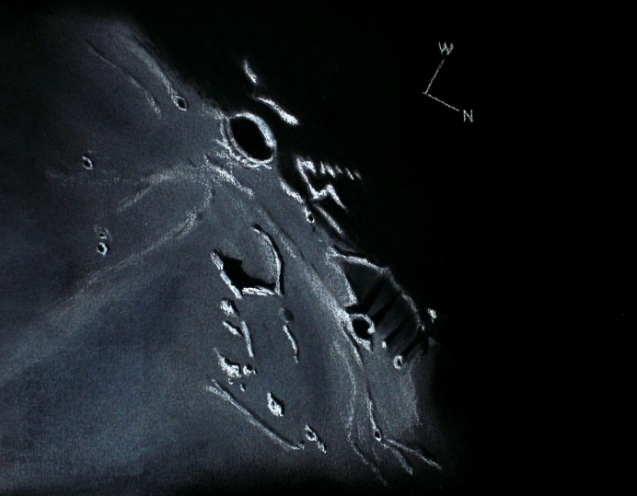 is a worn, an almost obliterated remnant, covered and surrounded by crater from 10-15 km. of various ages. Adjacent to Riccius is crater Rabbi Levi (81 km.) 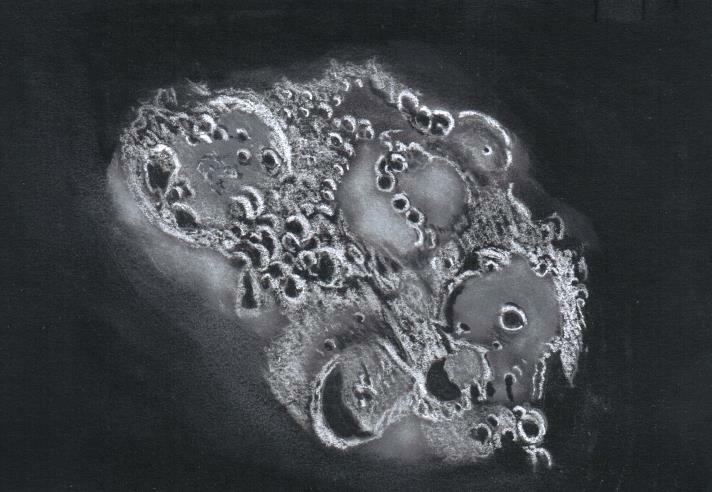 with an interesting short chain of craters across its floor. The next crater Zagut (84 km.) is the largest of those in the sketch with Zagut A (11 km.) near the center of the floor and Zagut E (35 km.) pushed through the eastern wall of Zagut. Next to Zagut is crater Lindenau (53 km.) which is younger than the other large crater here as evidenced by the sharper rim and what looks like a part of a central peak remaining. 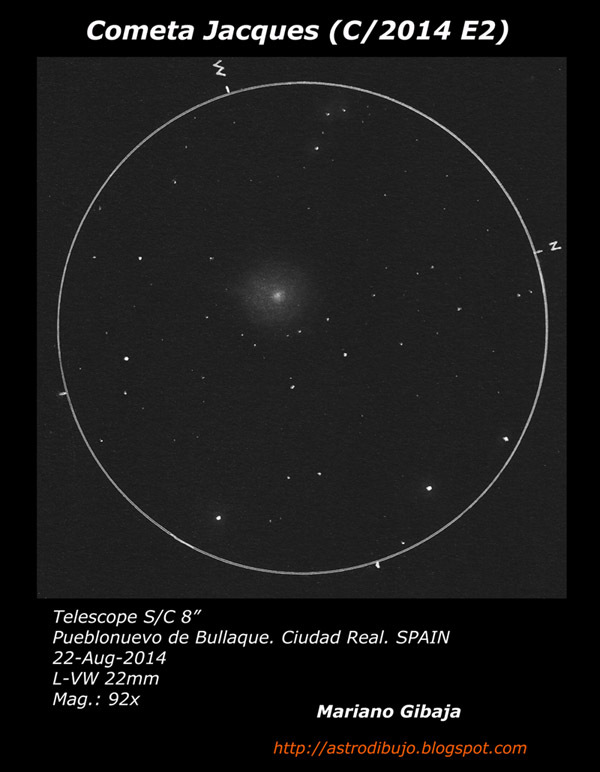 A fine summer evening of observing and sketching after a long spell of poor weather. black Conte’ pastel pencils and blending stumps. 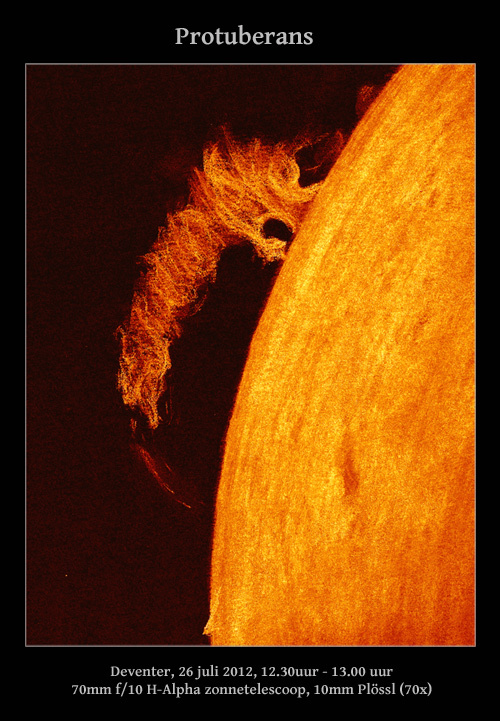 A large prominence on Sun’s SE limb 1st June 2014. Hard to imagine that these glowing clouds are cooler hydrogen gas surrounded by hotter transparent plasma. 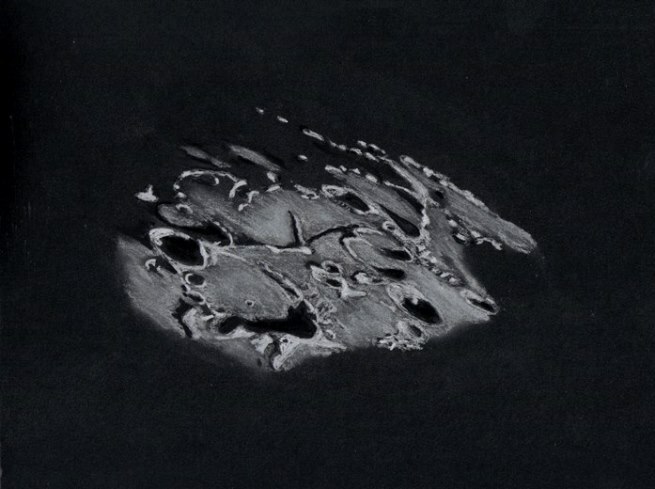 Sketched at the eyepiece with Derwent Watercolour pencils on black paper. SolarMax60 H-Alpha ‘scope 50-80X. Location UK. A couple of weekends ago saw Ice In Space Astro Camp ’14 happen at Lostock in rural NSW, Australia. I arrived late on the Friday, and when I finally settled at the camp it was dark and I just didn’t feel like setting up a big scope. 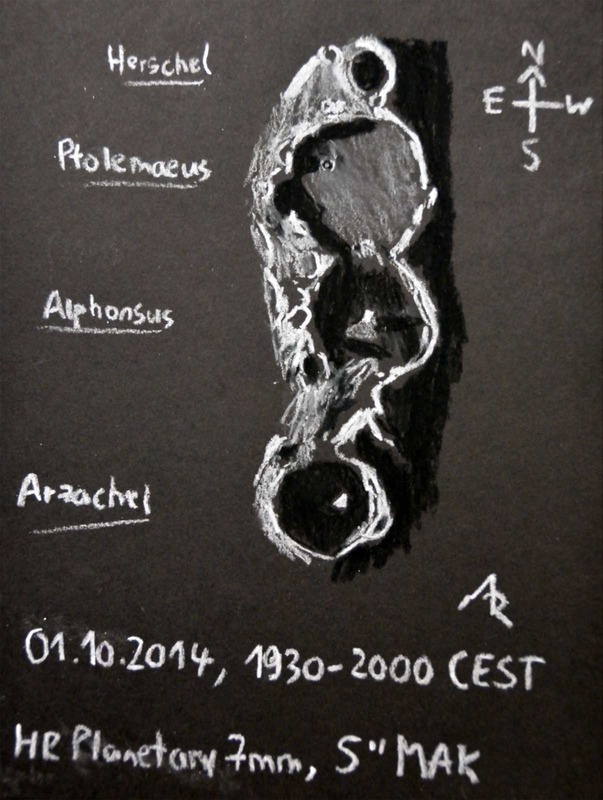 The sky was clear, the full brilliance of the Milky Way was arcing overhead, so it was a great chance for some wide field sketching with my little 4″ achro. 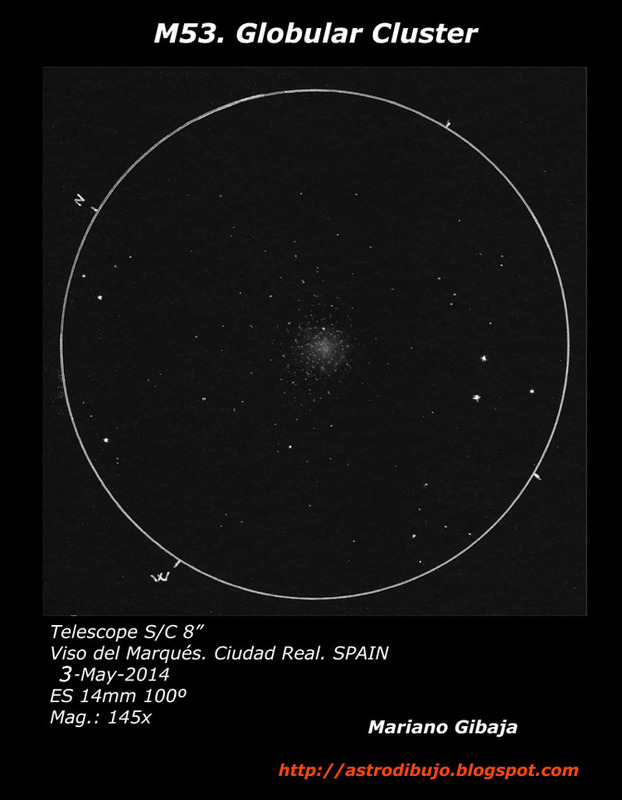 Some time ago I had made a mental note of a potential sketching target as being the area around the lovely cluster The Jewel Box in the Southern Cross. 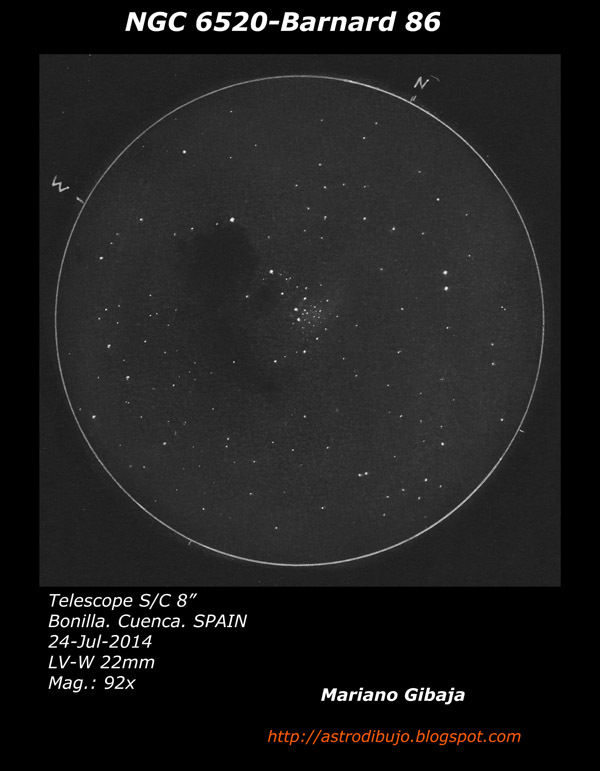 The great thing about this scope and eyepiece combination is the true field of view encompasses the Jewel Box, Mimosa or Beta Cruxius, and the western edge of the dark nebula The Coal Sack, all set off against the mottled background Milky Way. Gorgeous stuff! The Coal Sack is also surprisingly detailed. 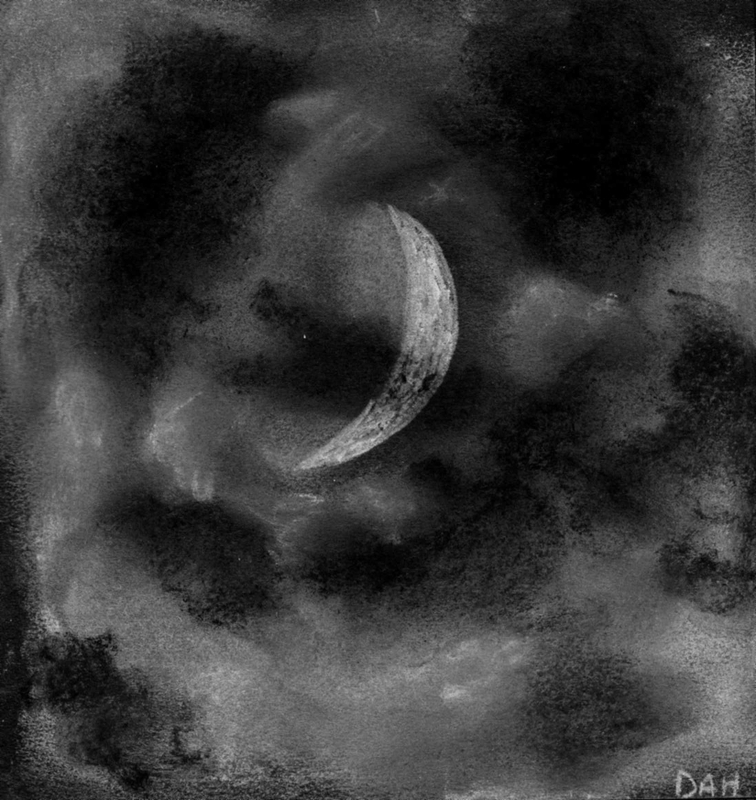 Streamers of darker lines, patches of brighter, and ghostly arcs. 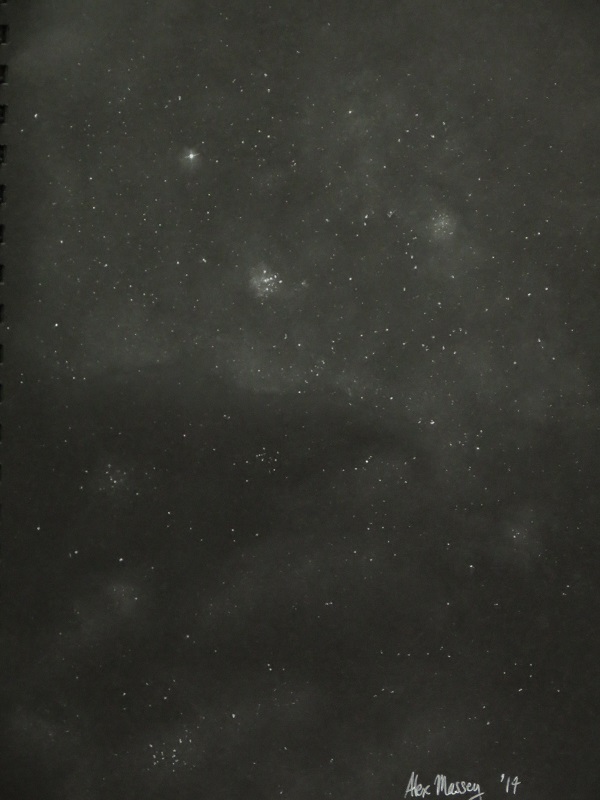 These details made for a great challenge as they are, well, black… Another fainter open cluster can also be seen just to the upper right of the Jewel Box. The Southern Cross contains dozens of open clusters within its boarder. 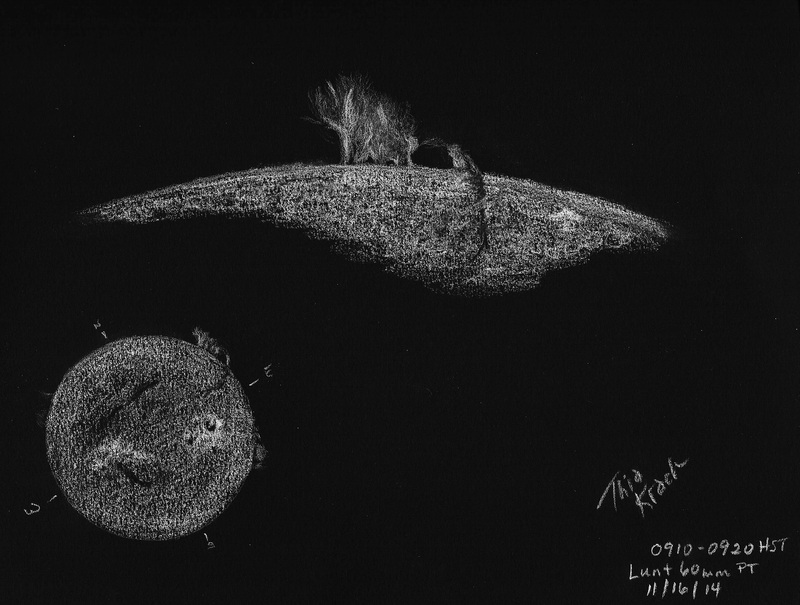 This sketch is very close to showing the full 5deg True Field of View I had. Object: Jewel Box and the Coal Sack. Gear: 30mm 82deg Explore Scientific, 17X, 5deg TFOV. 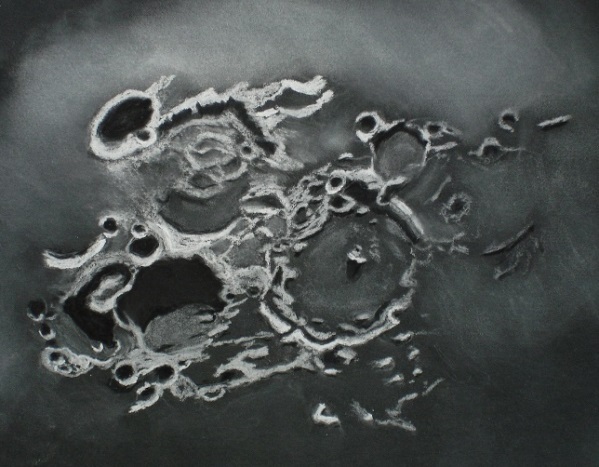 Media: White soft pastel, charcoal and white ink on A4 size black paper. For several nights this week the lunar North Pole has been tilted more towards earth due to favorable lunar libration in latitude. 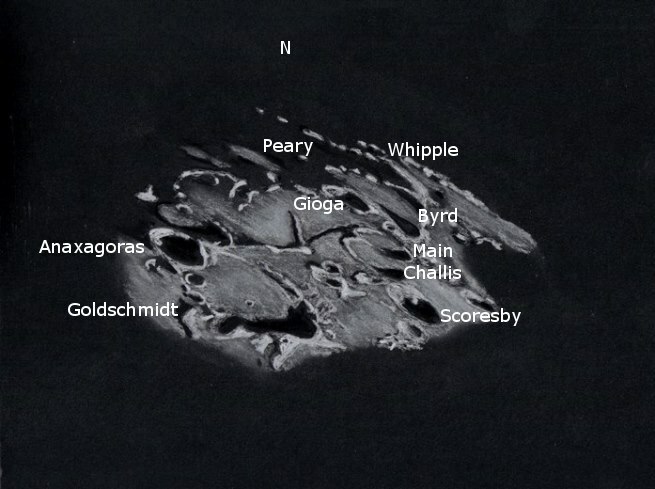 It has been a good opportunity to view craters such as Whipple, Peary, Byrd and others. 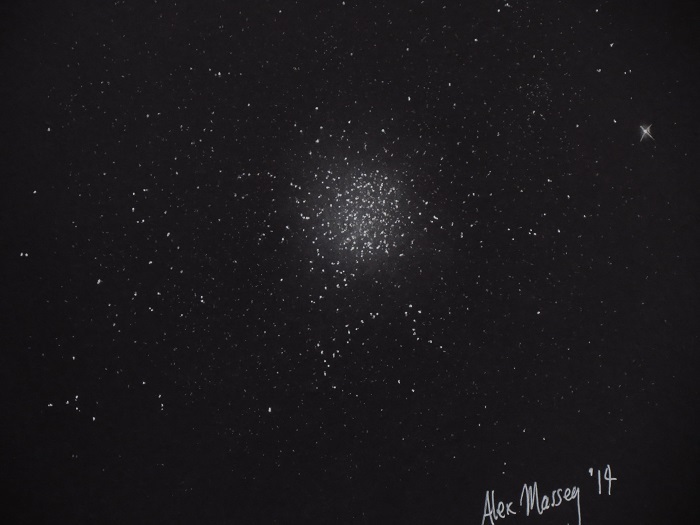 I had a clear night with average seeing so I took advantage of the opportunity to sketch the illuminated region near the pole. 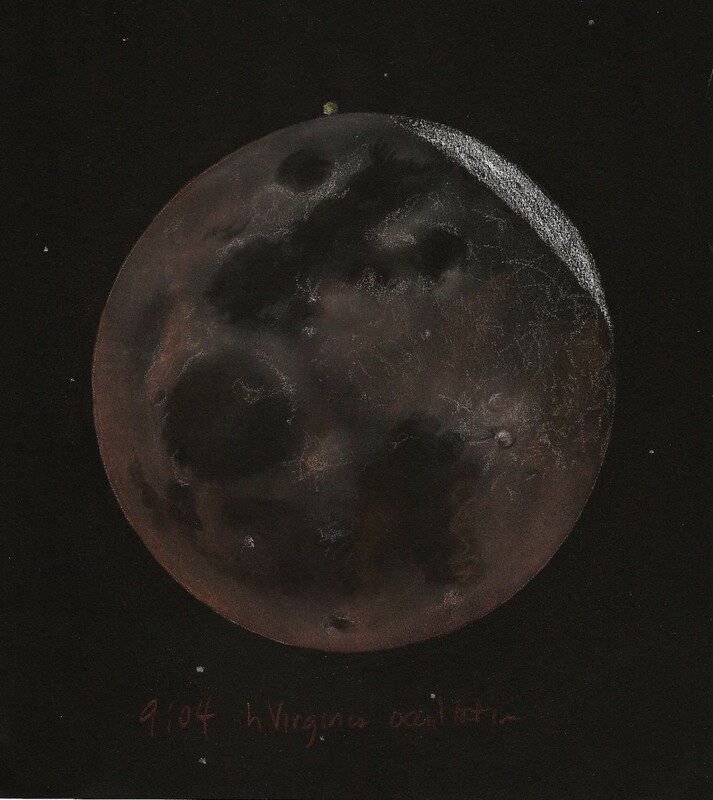 At my location the Moon was at more than 60 degrees above the horizon which also helped with the time needed to complete a sketch. 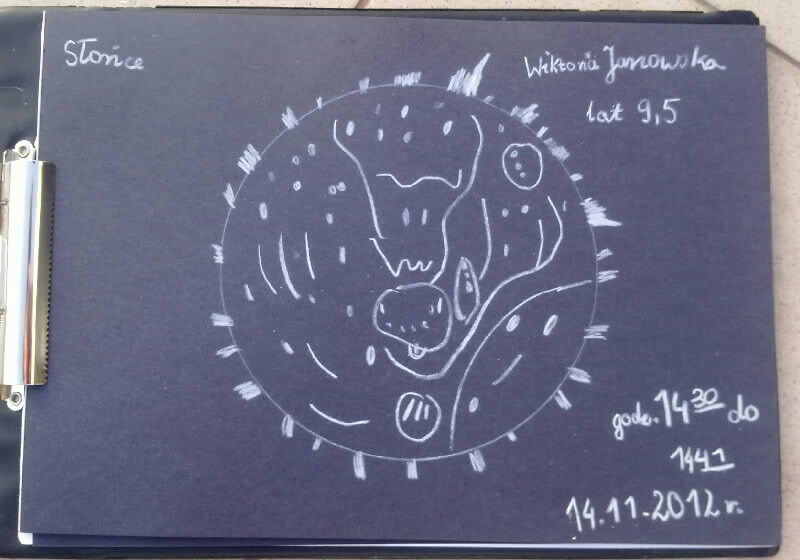 At the last day of October I sketched a beautiful conjunction between the Moon, Jupiter and Aldebaran. 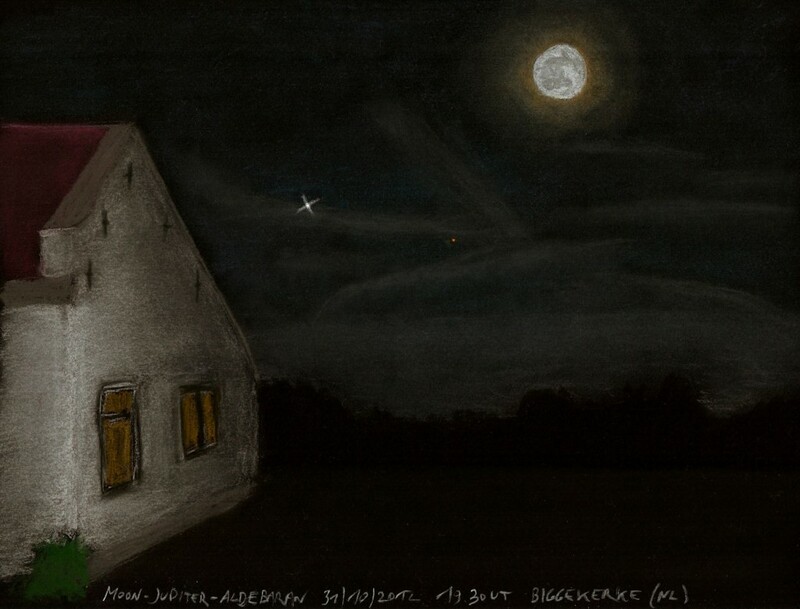 The building in the foreground was my holiday-resort (illuminated by a streetlight), a renovated farm from 1669. 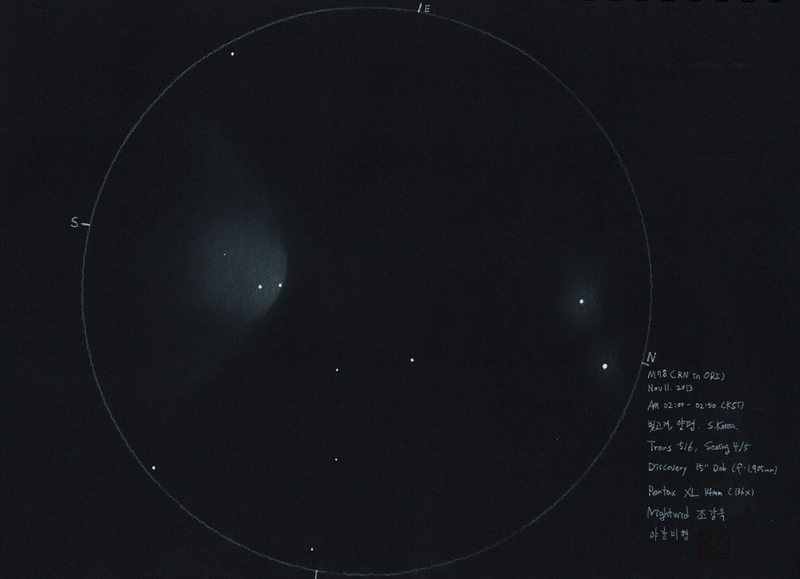 By chance: in the first months of 1669 Jupiter was also next to Aldebaran in the sky. So the first inhabitants could have witnessed a similar conjunction. To add some more history: the location was less than 10 km from Middelburg, the town where the telescope was invented! 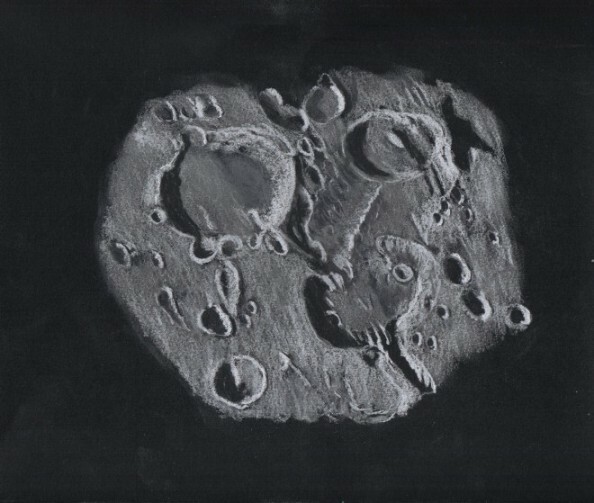 The southern lunar highlands expose the ancient anorthositic crust between craters. 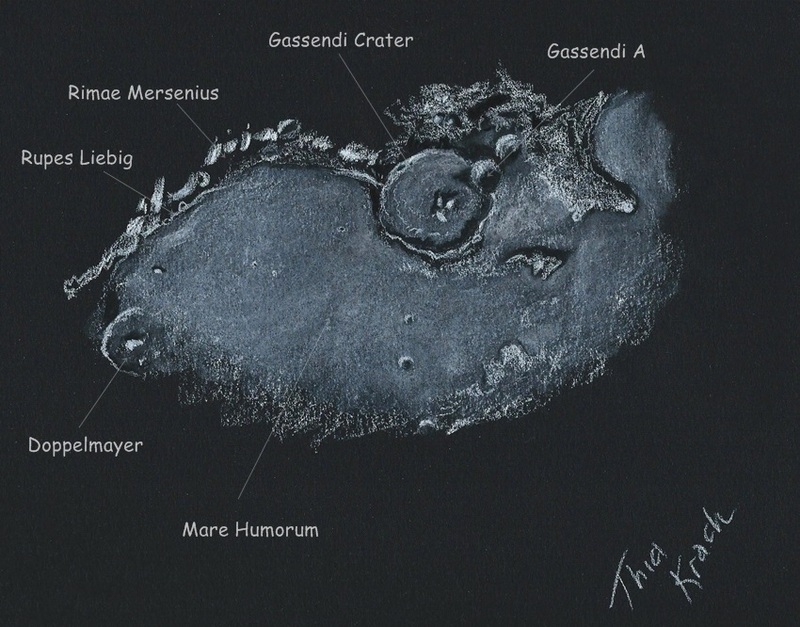 Centered in this southern highland sketch is the buried pre-Imbrian crater Heraclitus (92 km.) with its unusual central mountain crest. 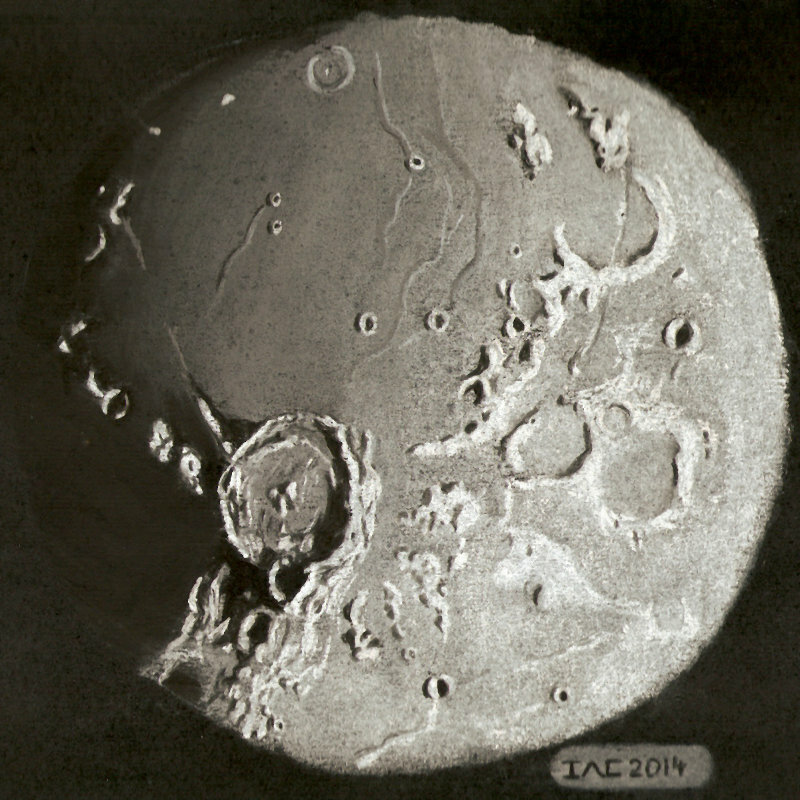 This ridge or crest looks much like the one on the floor of the elongated crater Schiller formed during its shallow angle impact. 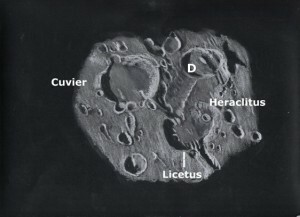 The ends of Heraclitus are buried under Licetus (77 km.) to the north and Heraclitus D (52 km.) to the south. Its easy to imagine this possible Schiller twin here partly hidden. To the east is crater Cuvier (76 km.) with its smooth floor and western wall pressing in on Heraclitus. 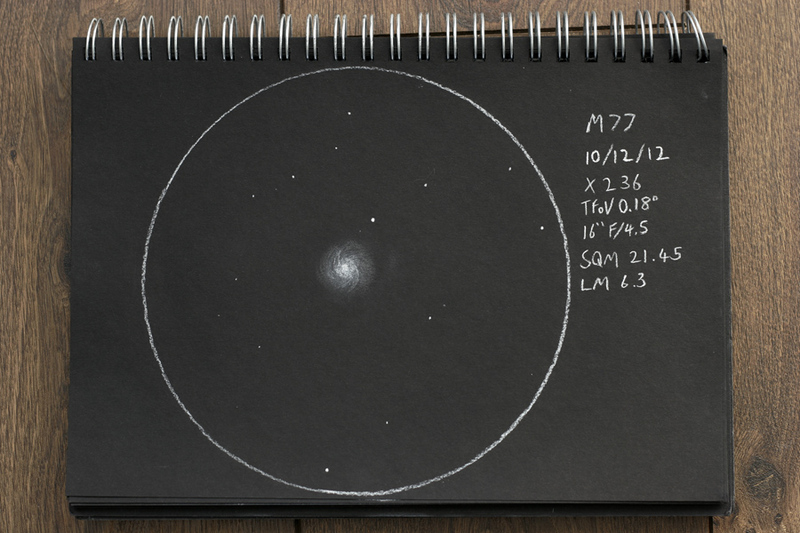 Last May, the latitude of the M20 is enough than I think. So I observe the Trifid nebula. 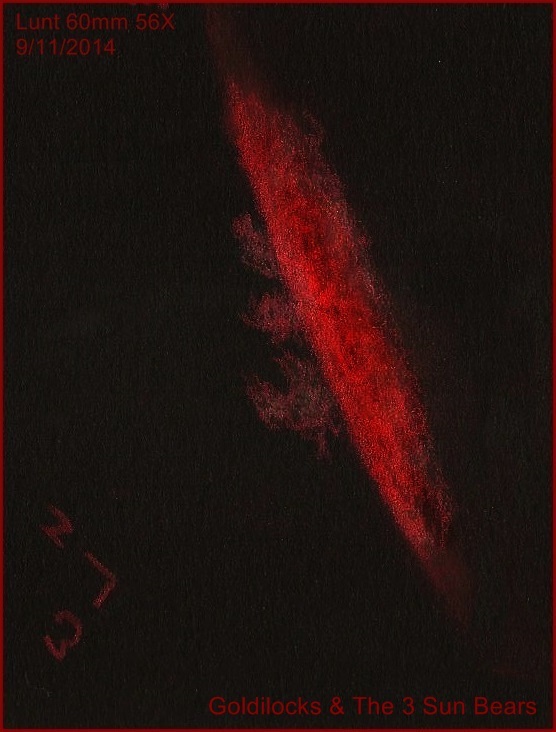 The most distinctive appearance is the asymmetric three-pronged dark lane and the two fuzzy star located in the middle of the nebula.